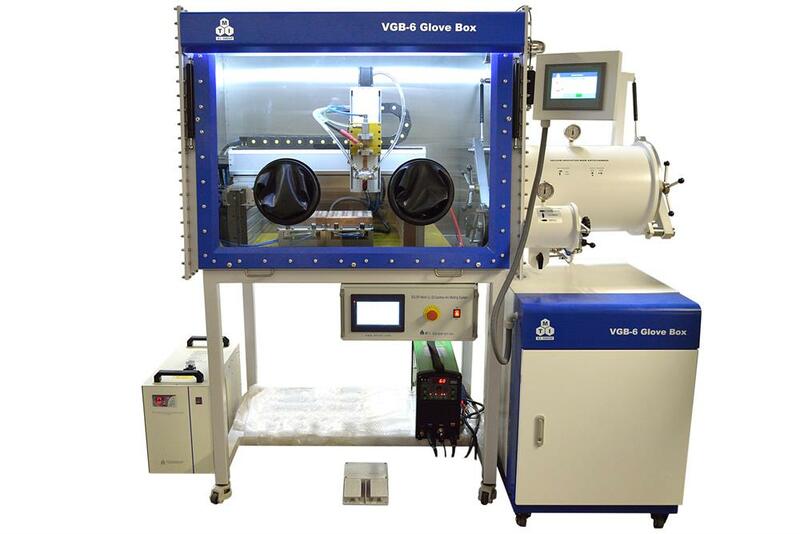 EQ-SP-MSM360 is a customized 32-station automatic Arc Melting System for high throughput MGI research such as alloy formation and phase diagram developments. 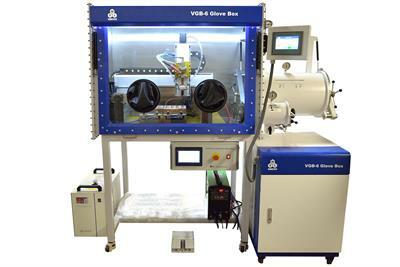 Such an arc melting system consists of gas-controlled/Vacuum glove box with CNC three-axis (X, Y, Z) of movement for precise "arc stinger" to "hearth cavity" positioning and stirring operations. 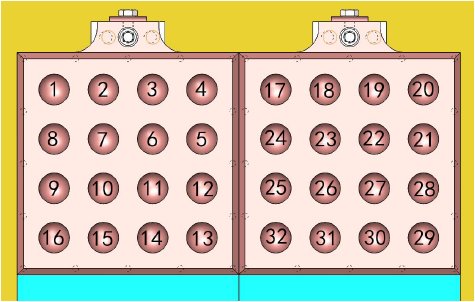 Up to 32 alloy specimens (two 16-cavity copper crucibles) can be produced in a single batch in an ultra-clean environment (<1 ppm H2O and O2 level). 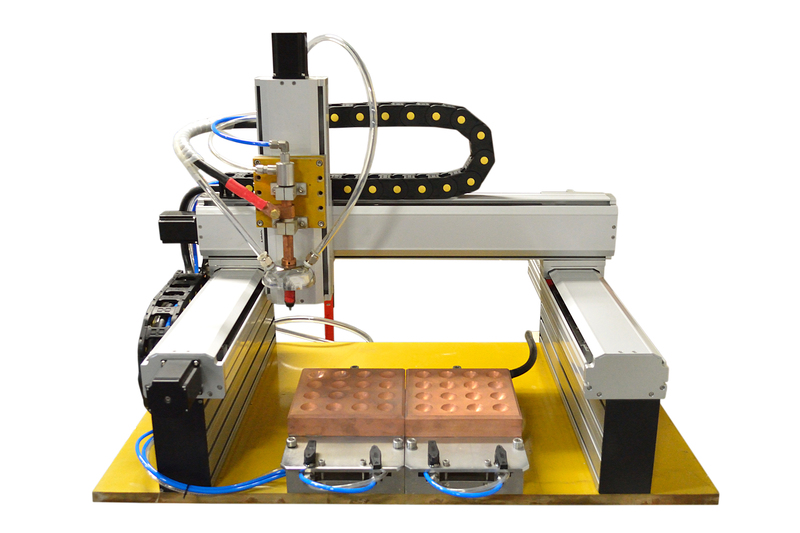 Manual arc melting operation with handheld arc melting stinger is also available. 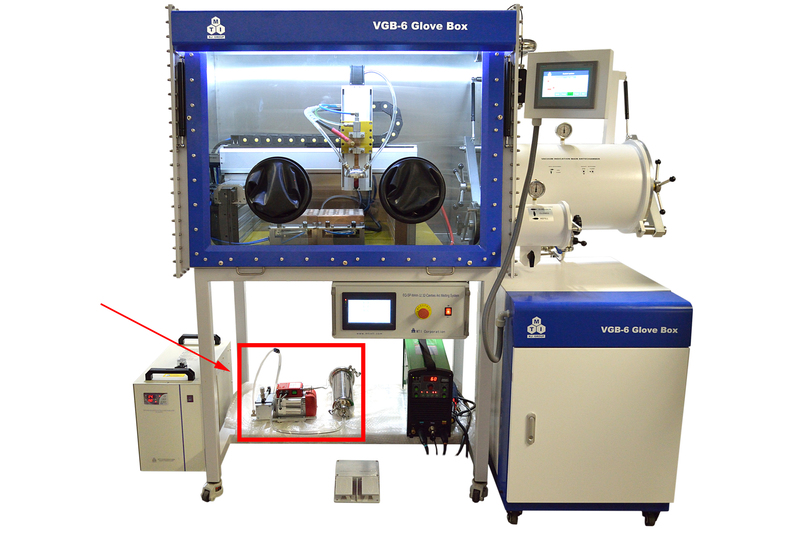 It is an efficient and economical system for high throughput MGI research of new generation High-Entropy Alloys. Water-cooled copper crucible, crucible grid cover, and vacuum dust removal (optional) allow arc melting of multiple samples without cross-contamination. 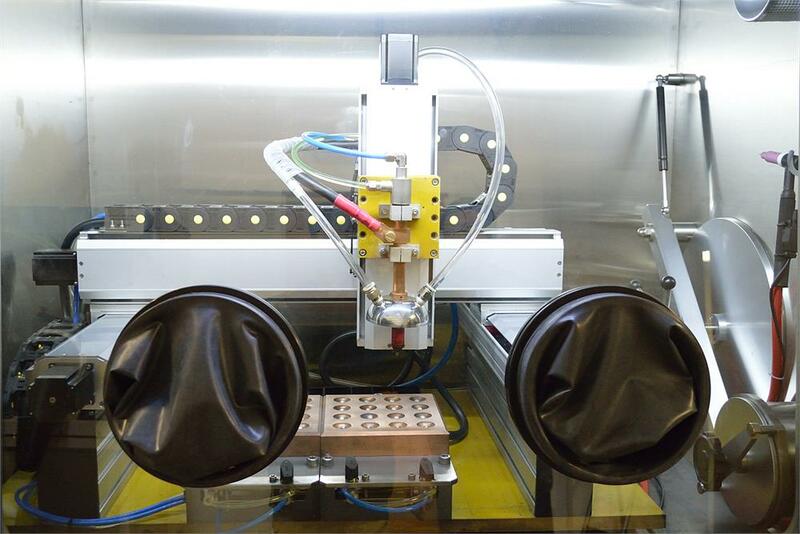 The tungsten electrode can be programmed with stirring motion for uniform arc melting of large samples. 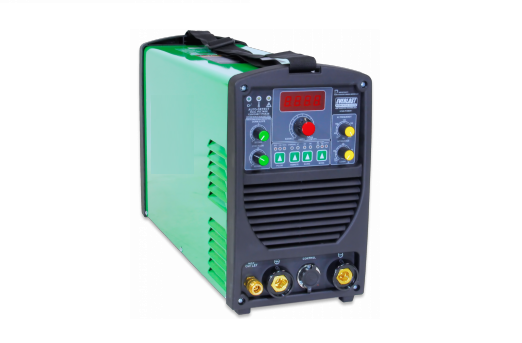 Powerful arc melting power supply enables reliable, stable arc ignition. Manual arc melting with a handheld stinger is available. Handheld arc melting stinger with KF40 feedthrough. 16 L/min recirculating water chiller for cooling the copper crucibles and arc melting stinger. 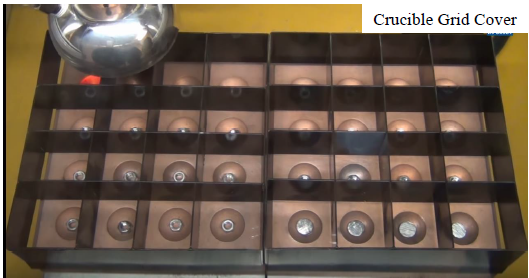 The Stainless steel crucible grid cover is included to protect the samples from cross-contamination (see pic.3 and pic.4 below). 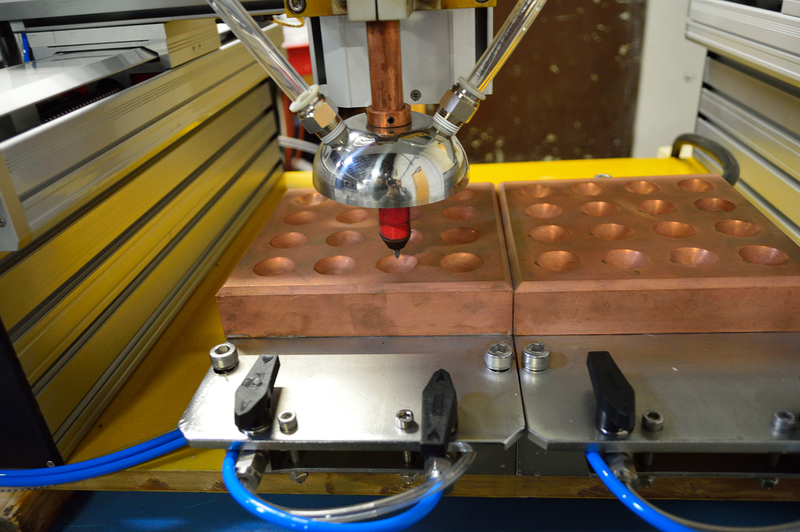 Water cooled rectangular copper hearth is installed on the X (or Y) axes motion table. 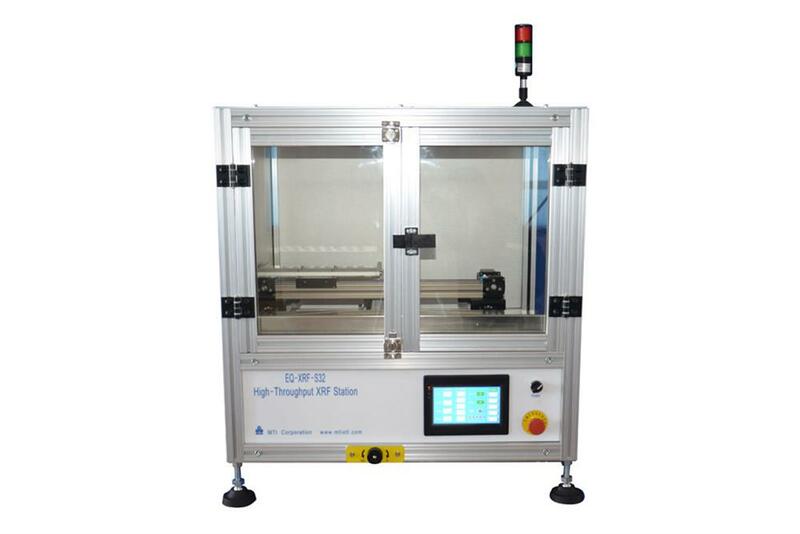 Touch screen CNC three linear axes (X-Y-Z) of motion enables precise "arc stinger" to "hearth cavity" positioning as programmed to achieve automatic melting by touch one button. The arc stinger travel in the pattern shown in the picture on the left. 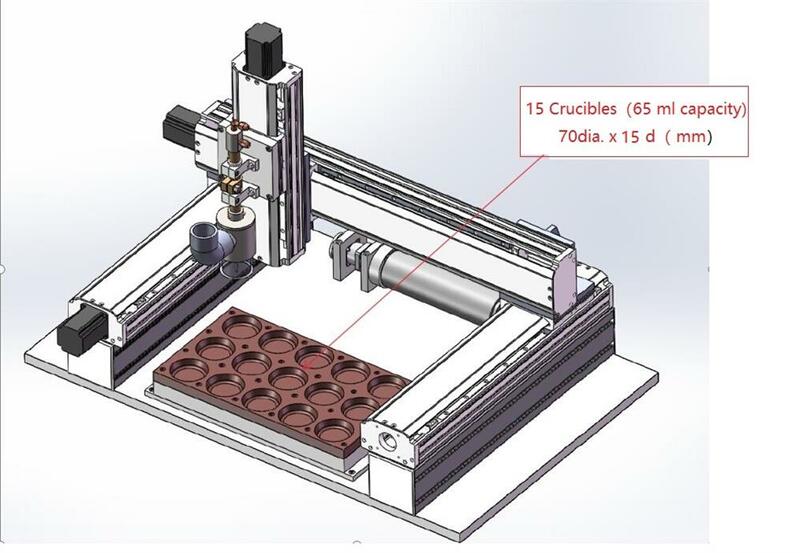 Stirring motion of arc melting stinger can be programmed for uniform melting of large samples. Operation Environment: Dry environment with good ventilation, 15-25 ℃. Air conditioner (not included) is required if out of this range. Two 175mm diameter glove ports with a pair of 6" Butadyl gloves. Pulse DC and AC output modes available. 240 L/m Heavy duty mechanical vacuum pump with exhaust filter is included. 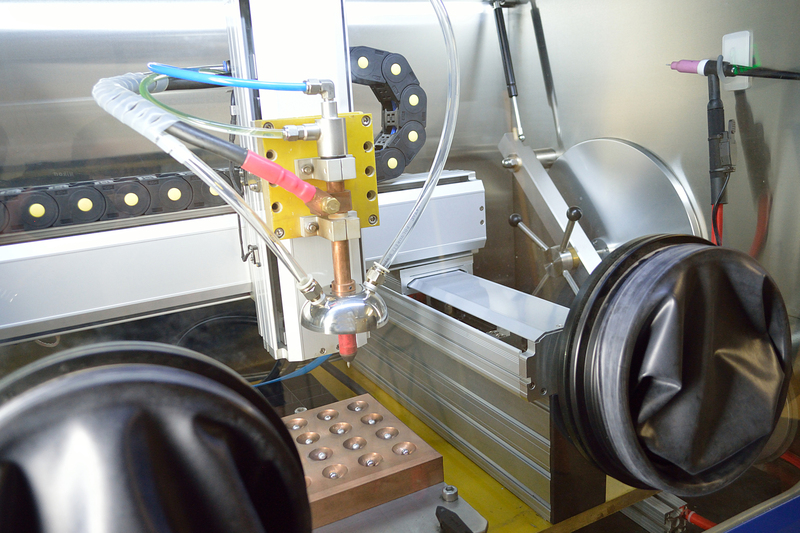 An automatic pressure control system can keep the pressure at a constant level. Manual pressure control is allowed via a foot pedal. MTI's KJ-5000 recirculating water chiller (16 L/min) is included for the water cooling of copper crucibles and arc melting stinger. 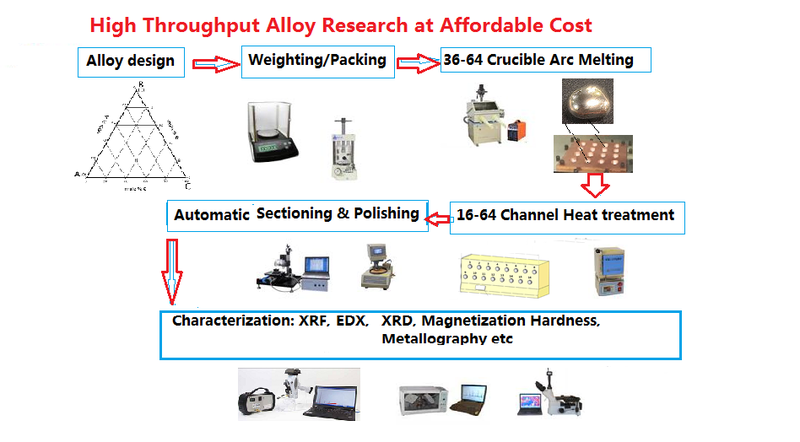 High purity Argon gas is with at least 5N purity (>99.999%) required (not included) for arc melting process. 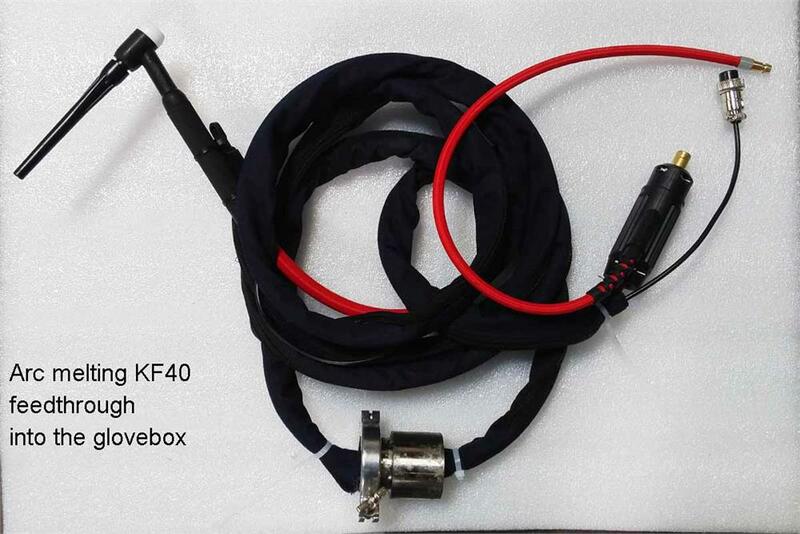 Gloves and oxygen sensor are consumable parts which are NOT covered by warranty. Regularly perform regeneration to maintain optimum purification efficiency. 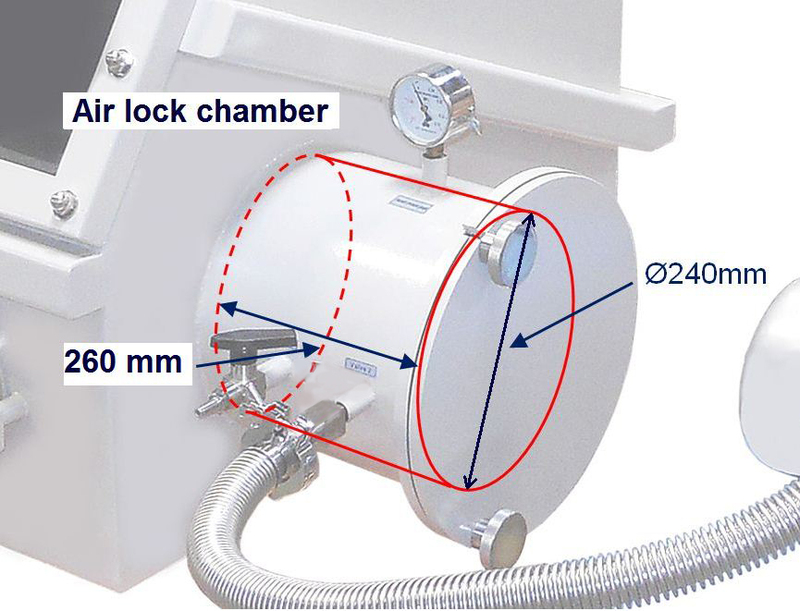 The O2 sensor is consumable and its expected life-span is around one year. Please order O2 sensor replacement at MTI at extra cost. 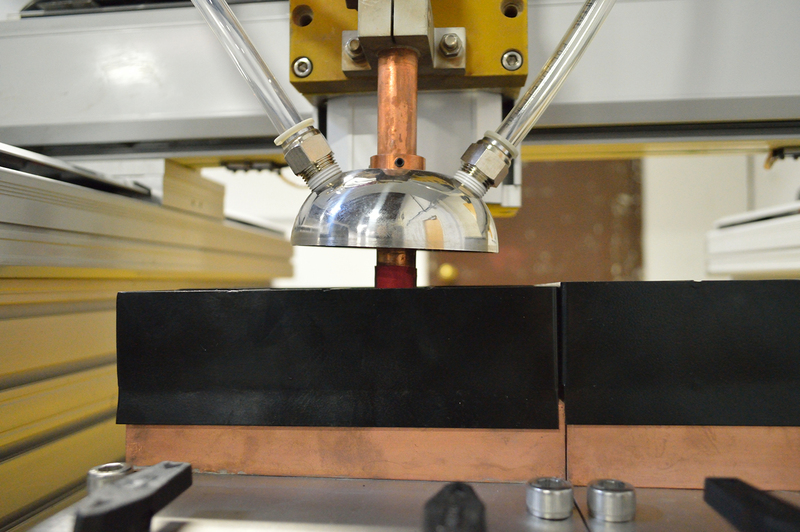 During the arc melting operation, never allow the tungsten tip to touch the material or the copper crucible! Move glove and had away from the copper crucible while the sample is hot or the arc melting is in operation! 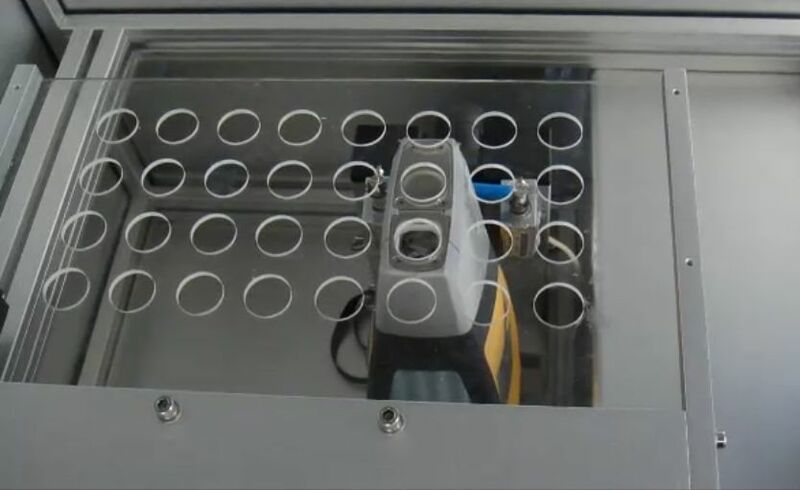 Use tweezers to manipulate the sample only after the sample has been cooled down. 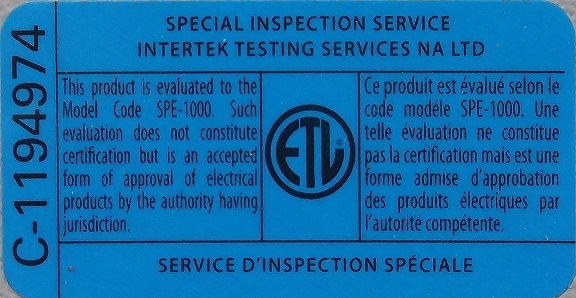 The user must wear safety glasses or mask with a tinted window when operating the equipment for eye protection. Do not use an arc melting current >80A when using handheld arc melting stinger, which overheats the handheld stinger. 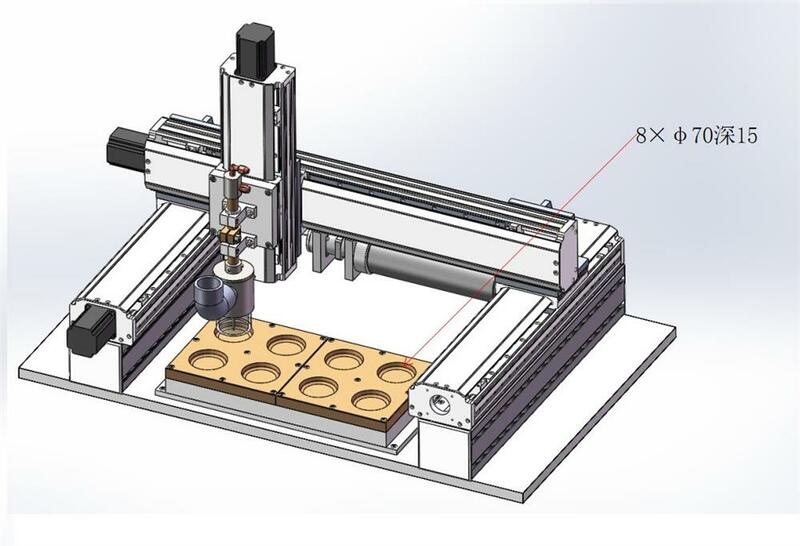 The 32-sample stage for cold embedded metal/alloy samples (max sample size: 26mm) is included.